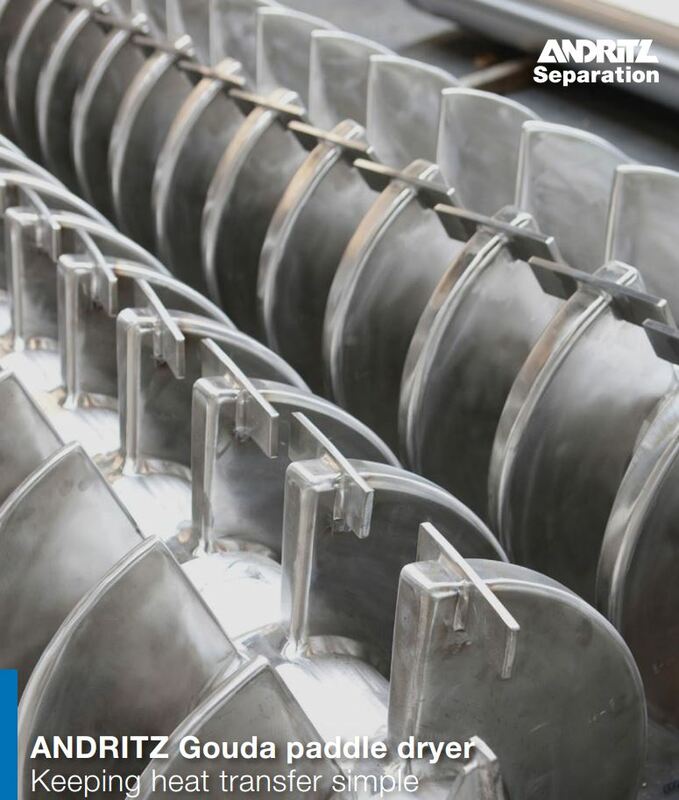 Paddle Dryer – Indirect (Andritz Gouda) | JCI Industries Inc.
Andritz Gouda – Paddle Dryer is a indirect or convective sludge heating system that evaporates (dries) liquid from sludge that it receives from a centrifuge or belt filter press. The dryer consists of a trough containing two counter rotating shafts, arrayed with paddles.The hollow design of the paddle shafts means that the entire interior surface acts as one large heat exchanger. Controlled agitation by the rotating shafts with paddles deliver superb product-to-surface interaction, for an optimal heat transfer rate. Thermal oil or saturated steam of 180 – 250o C flows continuously through the jacket, hollow shafts and paddles. As the sludge feeds in, the wedge-shaped paddles ensure perfect local mixing and mechanical fluidization. The paddles interweave as they turn to ensure surface contact with the sludge flow, leading to high evaporation rates inside the machine.The long sludge retention time combined with the average sludge temperature of 100 ºC make it possible to provide pasteurization and hygienic treatment of sludge – to Class A Biosolids under EPA 503 regulations. 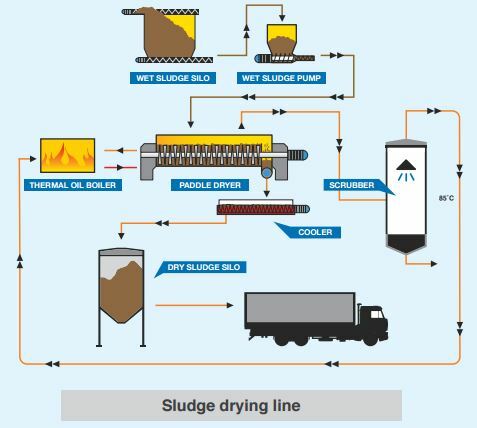 Due to the process, any type of sludge is accepted by this machine, making it extremely suitable for centralized drying plants accepting different sludges from different regions. As back-mixing is not required, any residual moisture level can be chosen for the end product. This makes the machine very suitable for partial drying to 35-40% dry solids to 95% full drying. 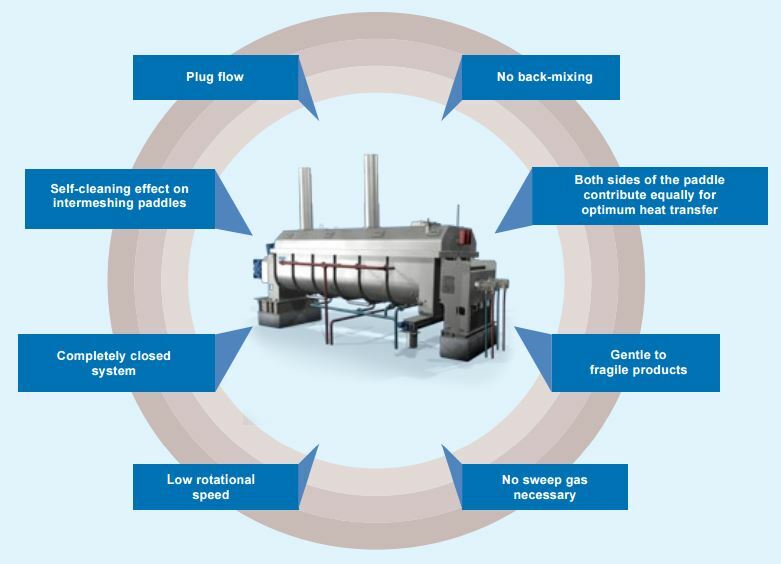 An indirect dryer has no airflow’s associated with drying the product resulting in simple control of odor control. The following video uses a model to illustrate the paddle dryer. JCI Acquires Colin Electric Motor Service Co.
Moyno’s EZStrip™ Split-Suction Sludge Pump reduces maintenance time by more than 90%. JCI Industries, Inc. More Than Doubles Shop Size, Demonstrating Service Commitment to Regional Customers.